This is the lineup of the 2012 beer tasting. 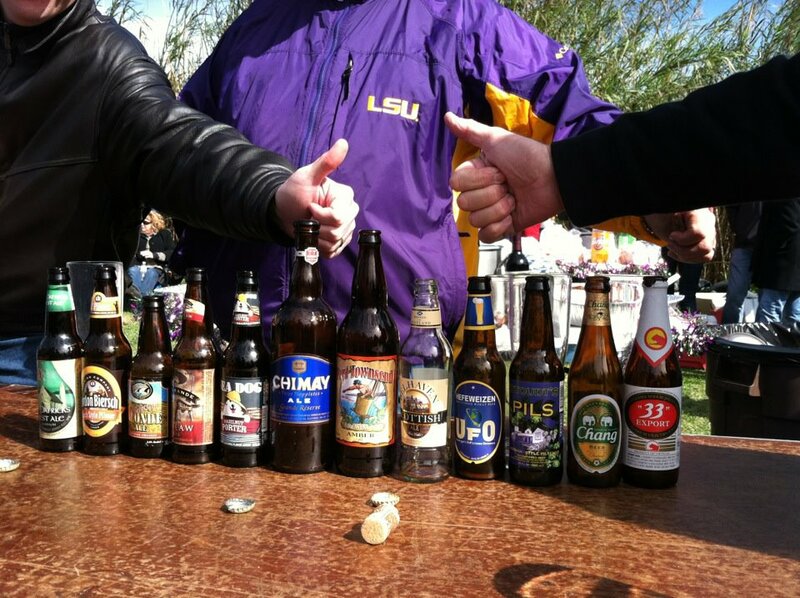 From right to left: 33 Export – Vietnam; Chang – Thailand; Stoudt’s Pils – Adamstown, PA; UFO Hefeweizen – Boston, MA; Belhaven Scottish Ale – Scotland; Port Townsend Amber Ale – WA; Seadog Hazelnut Porter- ME; Outlaw Lager Rio Grande Brewery – NM. My annual beer tasting is coming up at the end of January. We have it in Cut Off, Louisiana on the bayouside of Bayou Lafourche before the Krewe of Versailles Parade. I pride myself in getting unusual beers each year. Traditionally, we end the tasting by drinking the Chimay Grand Reserve. It’s a beautiful thing. 1 JOSEF bierbitzch golden pilsner El Monte,Calif. 2 Eel River Blonde Ale Scotia,Calif. 4 Boulevard Pale ale Kansas City,Missouri. 6 Monteith’s Black Lager New Zealand. 1 Sea Dog Wild Blueberry Wheat Ale Portland,Maine. 2 Orion Premium Draft Beer Japan. 5 Morland’s Tanner’s Jack Ale England. 6 McSorley’s Irish Black Lager Wilkes-Barre,Pa. 7 Tripel Karmelier Ale Belgium. 8 Lazy Magnolia Gulf Porter Kiln ,Miss.